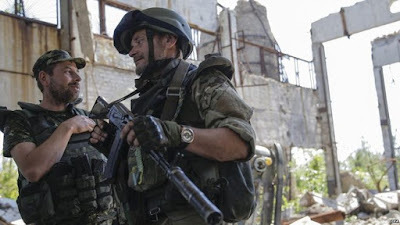 KIEV, Ukraine -- Ukraine says pro-Russian rebels have killed four of its soldiers and injured 15 in the past 24 hours. 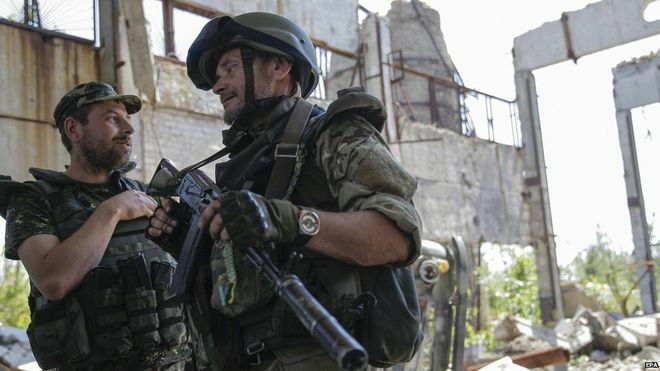 Ukrainian troops near Donetsk: After more than a year of fighting there is now a stalemate. The escalation came just hours before the latest round of talks on ending the conflict. The heaviest shelling was reported near rebel-held Donetsk. The rebels say they have imposed a night curfew in Horlivka - a city just north of Donetsk - because of heavy Ukrainian army shelling. There are daily exchanges of fire in eastern Ukraine, violating a ceasefire. The Ukrainian military described the situation over the weekend as very tense, with the insurgents violating the ceasefire almost 100 times. Ukraine, Western governments and NATO say there is clear evidence of Russian regular troops helping the rebels and arming them with heavy weapons - something Moscow denies. Ceasefire talks are continuing in the Belarusian capital Minsk, overseen by the Organisation for Security and Co-operation in Europe (OSCE). A peace plan was agreed in February, but the government and rebels have not completed a pull-back of heavy weapons.